Your new Gusti Leather bag has arrived! Before venturing outside where it will be exposed to the elements, here are a few useful things to note. So that you can have the most from your new bag, it's important to take good care of it. We highly recommend using an impregnation spray on the surface of the leather as soon as it is unpacked. A standard protection spray will protect the leather from moisture and sunlight. What care product(s) should I use? For optimal care of your Gusti Leder studio bag you simply need to be aware of the type of leather the product is made of. Whether suede, smooth or rough leather, there is a care product to help each type of leather remain soft and supple for up to 50 years and these will be found in most supermarkets or shoe cobbler shops. 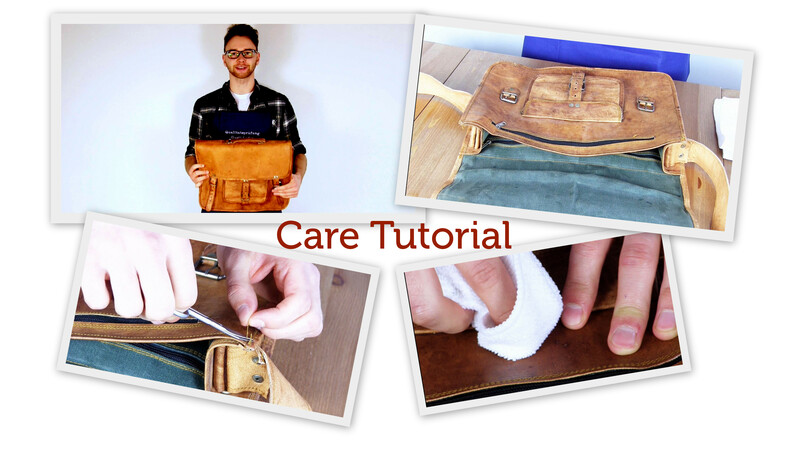 So that you can have the most from your new bag, it's important to take good care of it. We highly recommend using an impregnation spray on the surface of the leather as soon as it is unpacked. A standard impregnation spary will protect the leather from moisture and sunlight. Why does my bag have a strange smell? Is the leather smell a little strong? No worries! This can sometimes occur because leather is indeed a natural product which is ecologically produced. Regular use of the bag has proven to reduce the strong odour leaving behind that lovely, characteristic leather smell. We also recommend lying a perfumed sheet inside the bag for quick results. Why are there scratches on the leather? We use the hides from free range goats in our Gusti Leder nature products. This means that the leather can have small scratches from the trees or bushes where they roamed, for example. This simply proves just how natural our products are. However, if the scratches are too evident, simply apply a beeswax-based leather balm to a cloth or sponge and gently rub it into the leather. Be sure to apply this balm smoothly and evenly in order to avoid creating dark patches in the leather. Note: Beeswax-based balm can be used insted of an impregnation spray, but this will darken the whole bag. Why can I see so many loose threads? 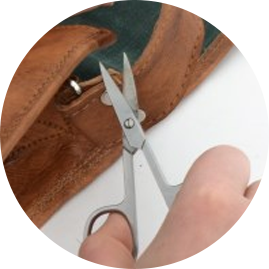 Our nature bags are individually hand-finished. It may, therefore, occasionally occur that the threads were not cut at the seams. The simplest way to fix this is to grab a small pair of scissors and carefully cuts the loose threads. Please take care that you don't cut too close to the stitching, otherwise this can lead to holes in the seams. What are these white marks? These white spots are grease marks and can be very easily removed. The oily nature of the leather causes those unsightly white marks and, again, a cloth or a sponge is all you will need. Gently rub over the marks and they will magically disappear.